Lou Quallenberg was raised in a home that doubled as a Photography Studio/School. Identified early as an artist, he picked up a camera as a young boy and never had the opportunity to look back. At the age of fifteen Lou began his fascination with Harley-Davidson Motorcycles. In his free time Lou spent many late nights creating and painting custom choppers for himself and friends, at a time when it was not a profitable business but an expression of style and individuality. 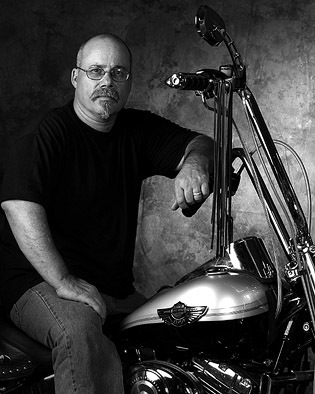 Lou worked in the family Photography Studios until he spread his wings in 1985 and went on his own to become a successful commercial photographer. He built a strong reputation, working with numerous large companies to create advertising photography of the highest caliber. In 1993 Lou met Cheryl Walker and discovered her love for her home state: Texas. In 2002 the lure of the Texas Hill Country was too strong to resist so they made a final move across the country to Llano,Texas, where they opened a Photography Gallery. Lou had already uncovered his love for wood, this move gave him a chance to concentrate on that passion and hone his skills. 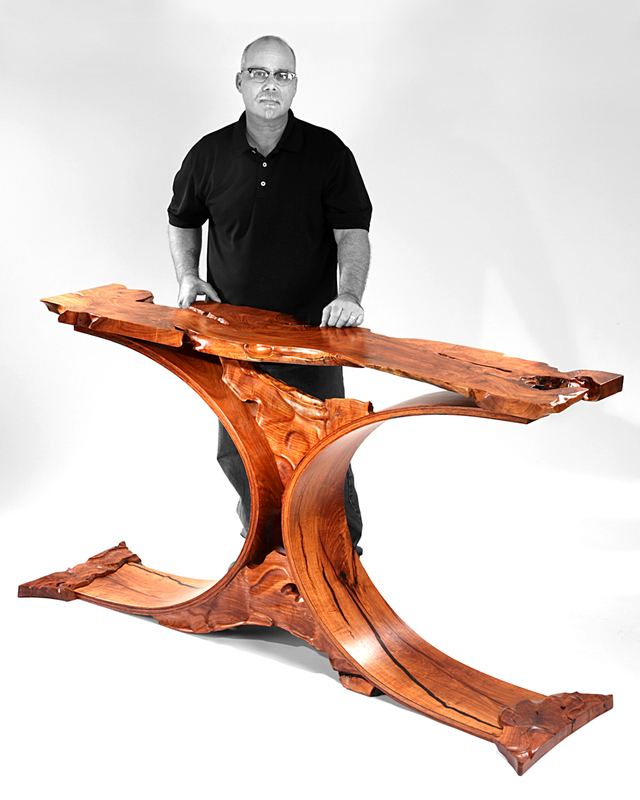 It also gave him a chance to work side by side with Steve A. Walker his Father-in-law, Partner, and Mentor, creating furniture with an eye towards design. 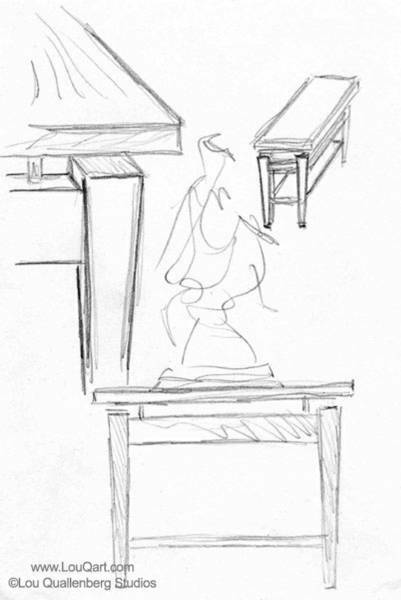 Take a peek into Lou Quallenberg's Sketchbook here. 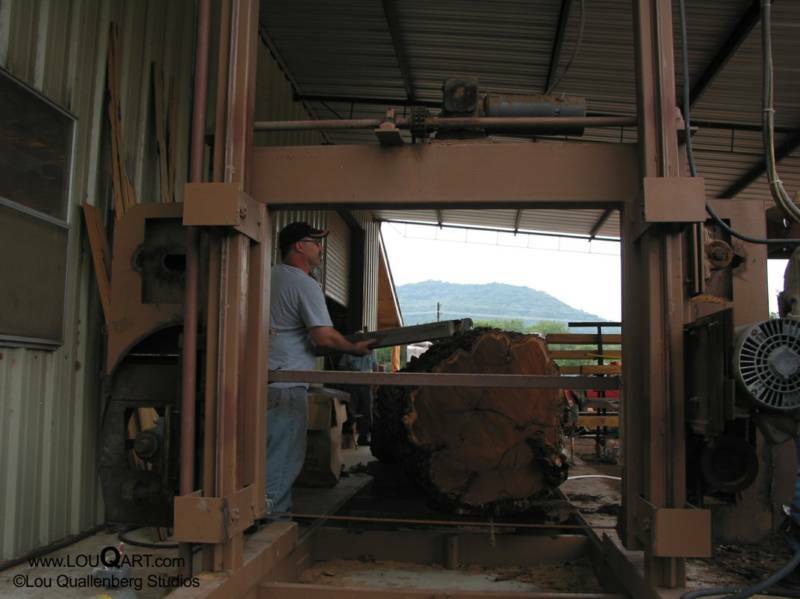 Prosopis wood is perhaps the most dimensionally-stable of all woods in having equal radial and tangential shrinkage values of only 2%-3% and in having total volumetric shrinkage values of 4%-5%. This results in less shrinkage and cracking, and abundant wood elements give high tensile strength. Other fine woods i.e. 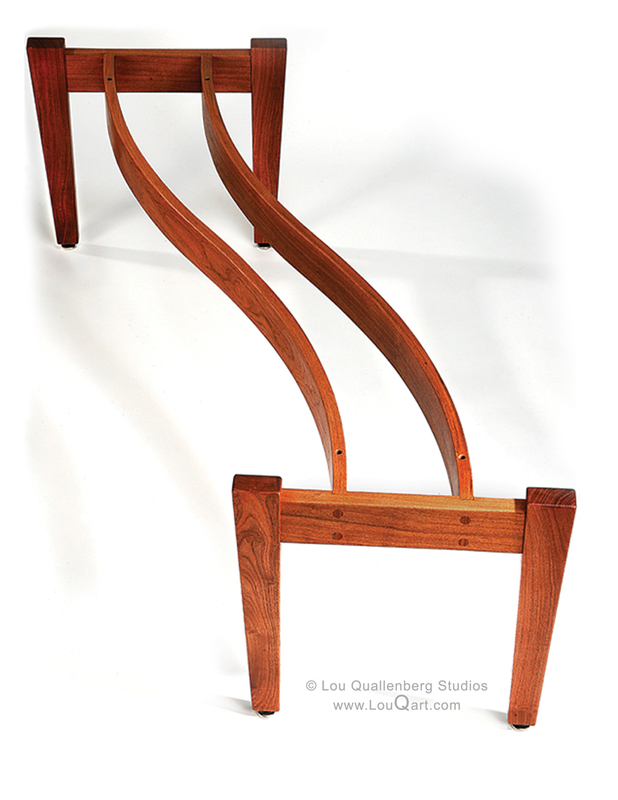 oak, cherry, walnut,teak, mahogany and Indian rosewood have volumetric shrinkage values in the range of 8%-15% The result of the low shrinkage value is that furniture made from Prosopis will have less expansion and contraction when ambient humidity levels change, such as from summer to winter in northern regions. Thus furniture will not crack and drawers will not stick with changing humidity levels (Felker,1996). 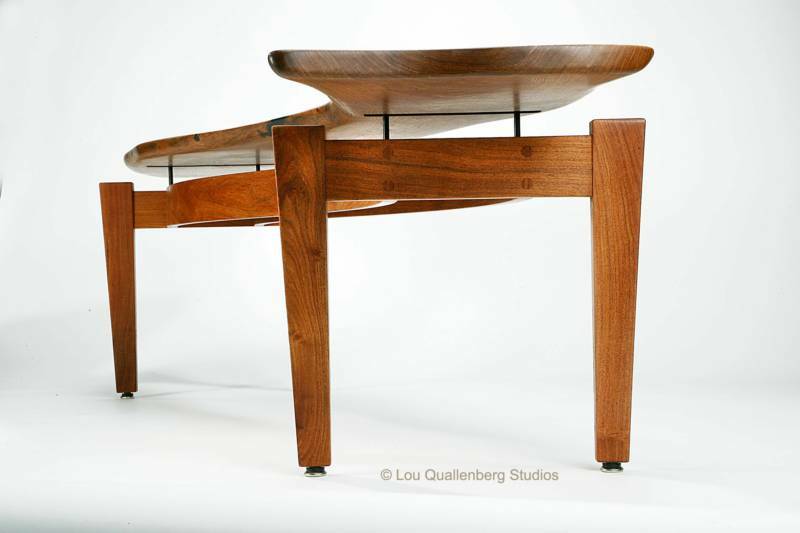 The mesquite wood's density or hardness makes it ideal for Lou Quallenberg's art furniture. It also makes it a very hard wood to work. 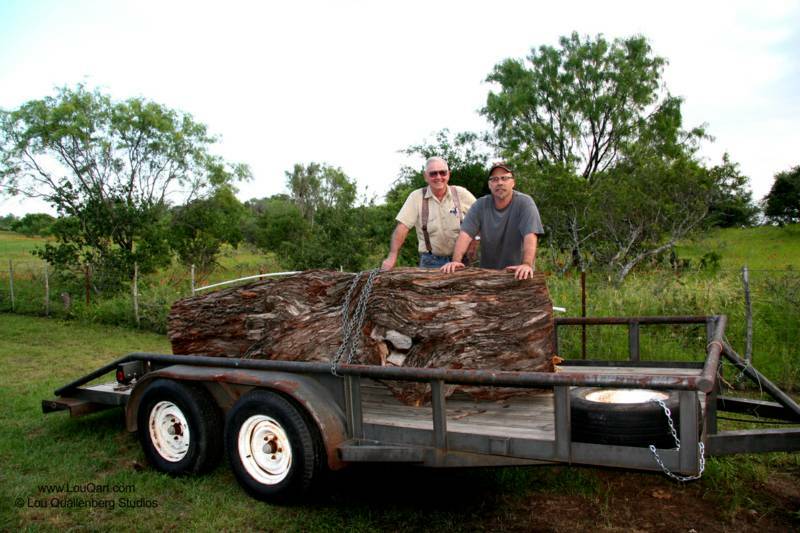 Our wood comes from the southern most region of the Texas Hill Country. The trees are hand picked for their unusual character and curves with the hope that these qualities can be utilized in the design process. Choosing trees comes with a certain amount of the unknown. You cannot be sure of what character and qualities lie inside the tree until you cut into it. One of our favorite saying is "Mesquite trees are like a box of chocolates!!" 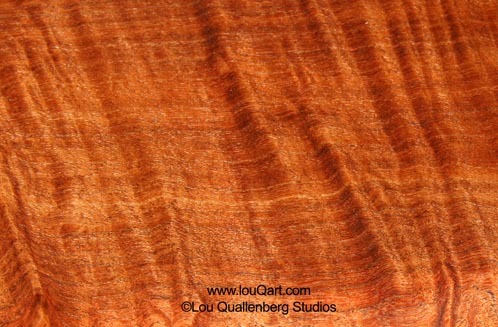 Fortunately we desire the natural cracks, crevices, burls and streaks that create the amazing character of mesquite. Mesquite comes in many shades from golden blonde to a deep, rich, red with many shade variations in between. 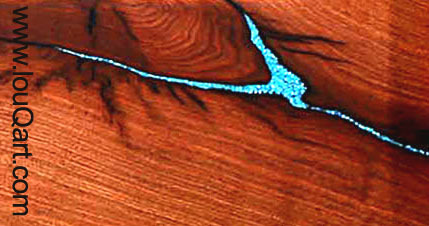 The color of the wood deepens with time as it is exposed to ultraviolet light. 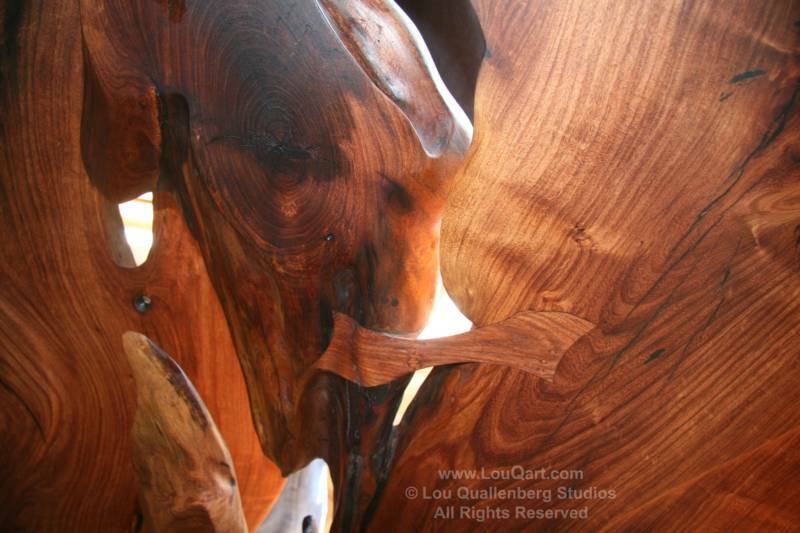 Adding to the mystery, magic and mystique of mesquite. 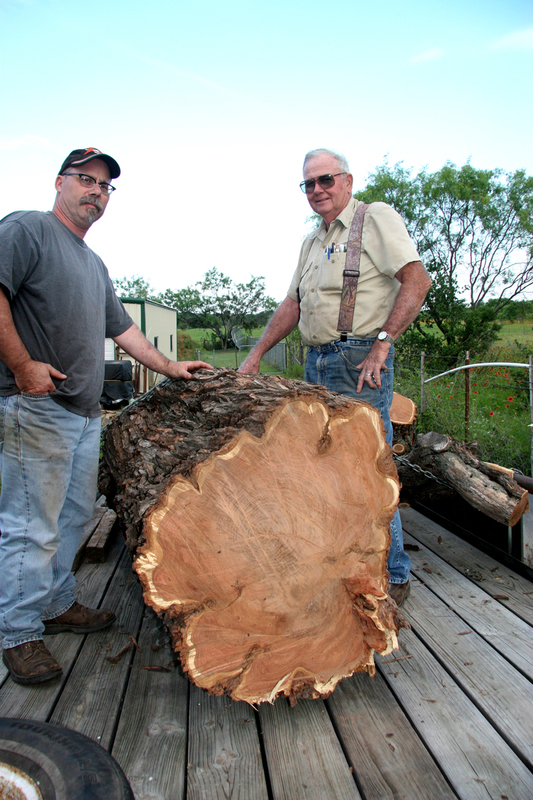 Once the mesquite tree has been chosen it is time to slice it open and discover the true beauty and character hidden inside. The size of some of the trees we choose can pose problems in finding a mill with a saw that can handle not only the girth of the tree but also the curves we desire. 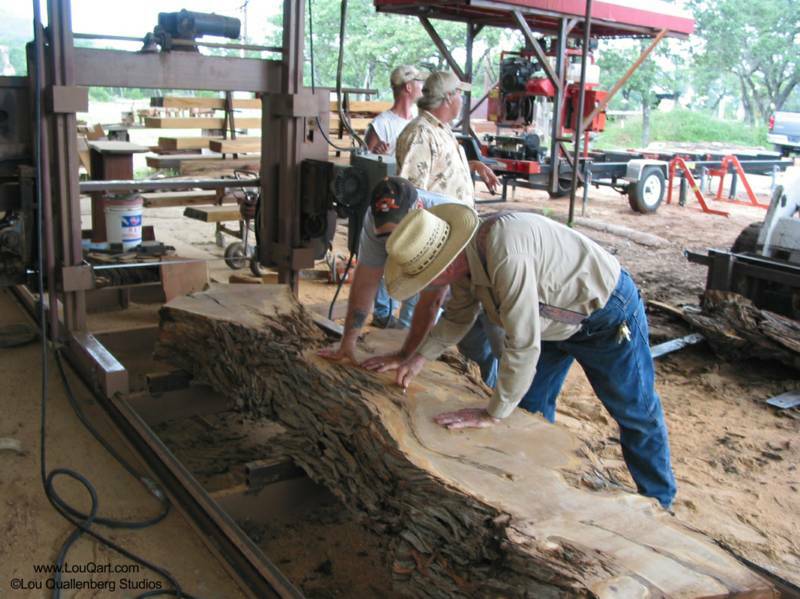 Drying the wood (mesquite) is one of the most important preparation processes we implement. 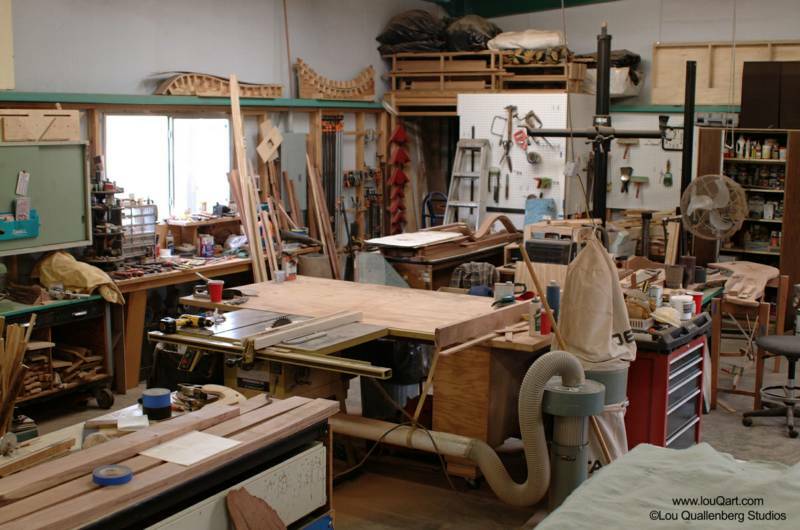 Many in the industry consider proper wood drying an art in and of itself. 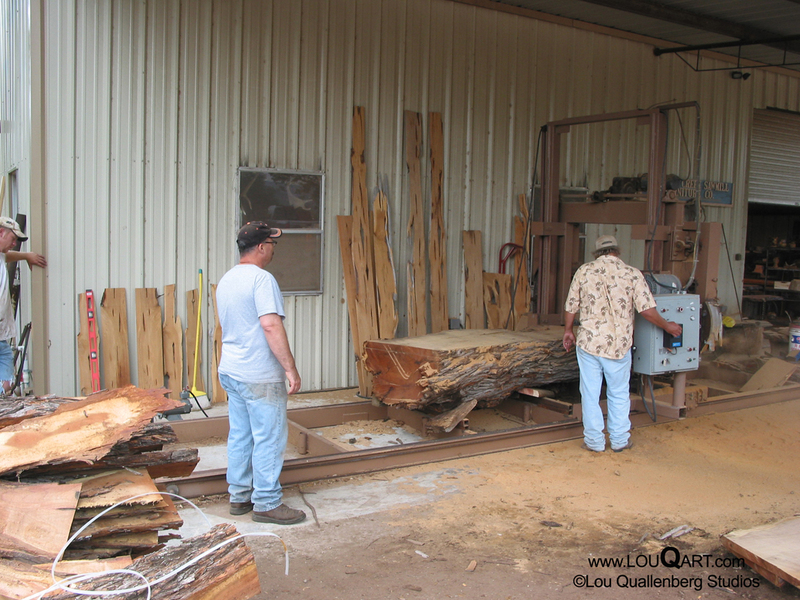 Mesquite is a very hard and stable wood once it is completely dried. 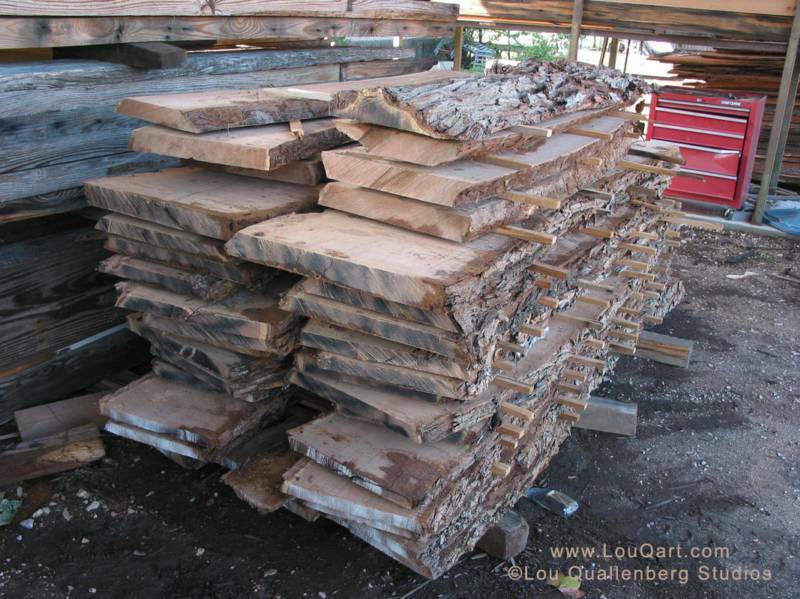 Problems with shrinking, cracking and insects only occur when mesquite is not properly dried. We prefer to both kiln dry and air dry our wood. We do not begin to work with the mesquite until we get the moisture content into the 7% to 10% range on a moisture meter. 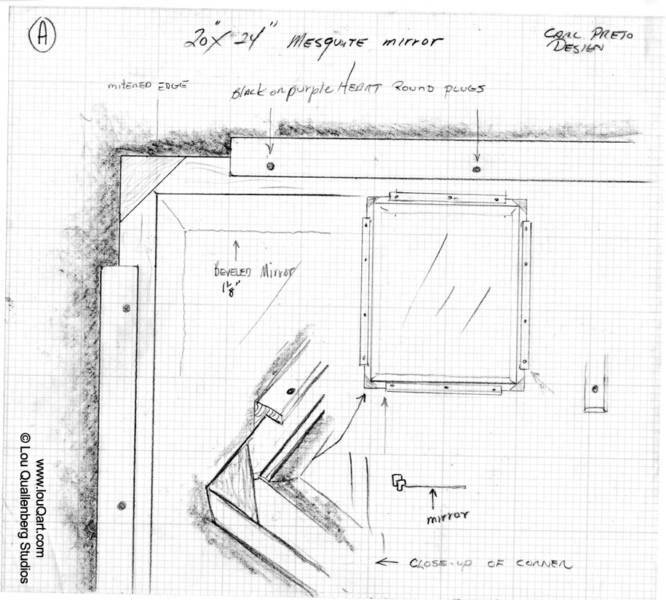 Our construction process begins with a sketch or several sketches created by Lou Quallenberg. He begins by looking at the individual piece of wood and listening to it. The wood tells him how it wants to be used. 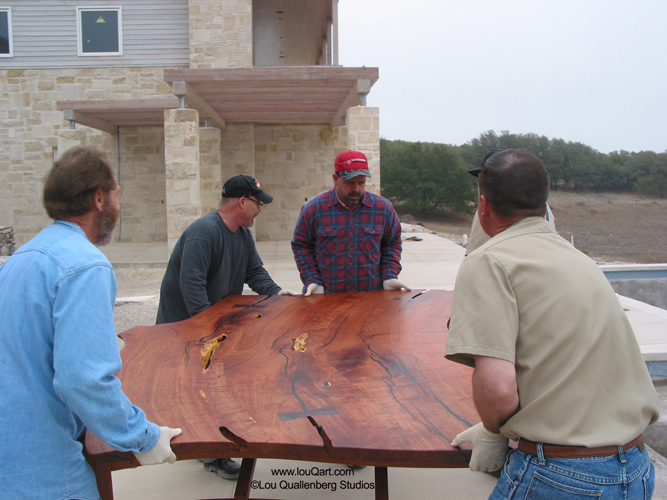 Once the sketch is done Lou begins work on the mesquite laminates that will match the natural curve of the top. 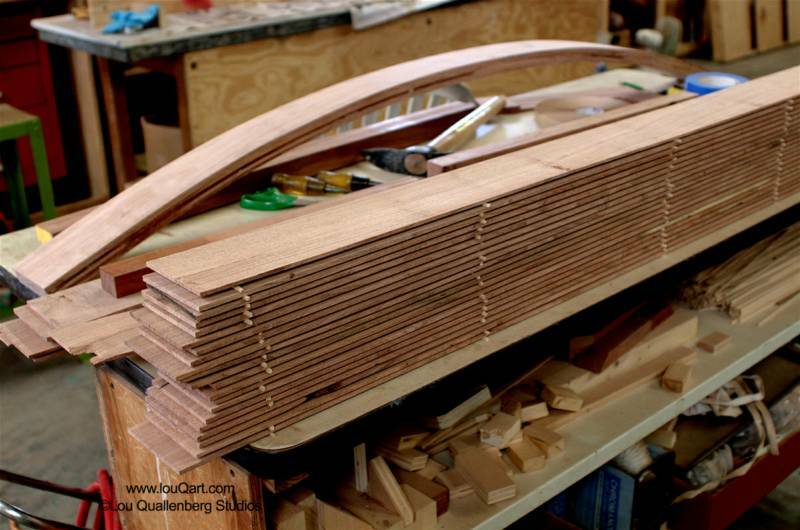 By slicing the wood into 3/16" or 1/4" thin strips and then gluing the strips back together the mesquite can be bent into the strong curves that are a signature of Lou's work. 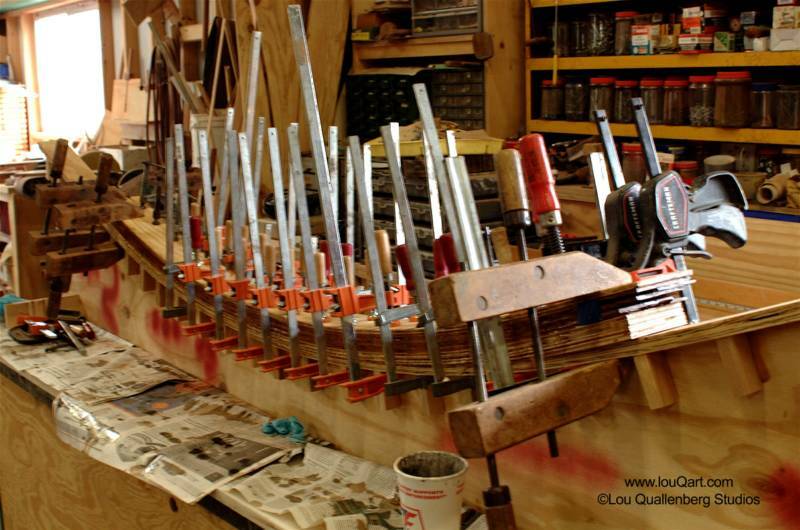 Once glued the strips are clamped into a form creating the curved shape. Sometimes the cracks are in a place that can't be filled in so we use a "bow tie" or "butterfly" patch or plug to add strength. The bow ties can be made in a similar wood and grain or they can be made from a contrasting grain or wood. Texas Ebony makes a beautiful bow tie accent to the mesquite. Thin 3/16" to 1/4" slices of wood are cut and glued back together to create the curves that serve as strong support and give our work it's distinctive curvy appeal. These laminated pieces can be stronger than the original piece of wood. These curves are a signature of our pieces. 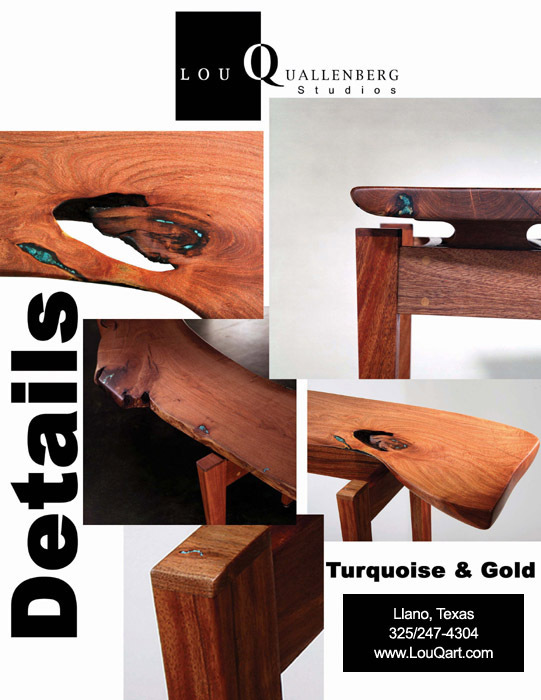 Specially created steel pins mounted and screwed into the table/desk tops and then inserted into holes in the mesquite base create our signature floating tops. If you would like to place an order and secure a spot on our schedule please contact us for a free phone/email consultation. We will discuss the piece you would like to have created. You will be provided with a simple sketch, approximate time line and a price quote at that time. Once a price and design have been agreed upon a deposit of 50% of the purchase price must be paid to begin the construction of your piece. We will email photos throughout the process to keep you up to date on our progress. The remaining 50% will be due just prior to shipment/delivery. We will personally deliver your furniture right to your door if you live in the Austin or San Antonio Metro area or our area of the Texas Hill Country. If you live outside the delivery area we can crate and arrange shipping with a freight company. We might even consider door to door white glove delivery to your home if it is in a location that we have yet to explore..... Just ask us about white glove delivery. Our furniture is 100% customer satisfaction guaranteed. We stand behind the quality and craftsmanship of our work. We will work with you in every way possible to achieve your satisfaction. with a big ole mesquite tree.